LOS ANGELES -- Lakers forward Brandon Ingramis scheduled for a preliminary MRI on his left ankle Thursday night and the team is expected to provide an update on Friday. The Lakers (15-9) begin a two-game road trip Friday in San Antonio, but Ingram didn't travel with the team. Los Angeles finishes the trip in Memphis on Saturday. Ingram injured the ankle in the first quarter of Wednesday's 121-113 win overSan Antonio when he took a jump shot and landed on the foot of Spurs big man LaMarcus Aldridge. After an official's review, Aldridge was called for a flagrant foul 1 for sticking his foot on the spot where Ingram was going to land. 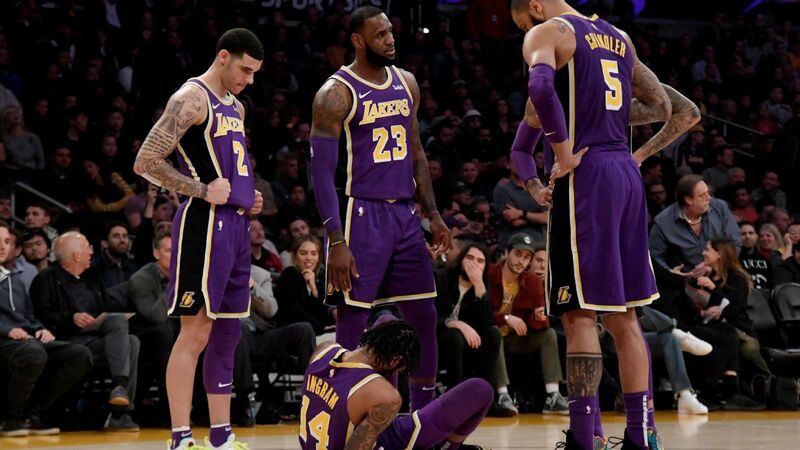 Ingram, whose ankle turned all the way to the floor when he landed, was on the floor in pain after the foul as his teammates surrounded him. Ingram made the jump shot and stayed in the game to shoot the free throw, which he also made, before checking out with 6:34 remaining in the first quarter. The third-year veteran received X-rays on the ankle, which came back negative, but the Lakers still ruled him out from returning to the game. Ingram, with a heavy wrap on his ankle, used crutches to get around the postgame locker room, but he left the arena walking without them. "I feel way better than I should," Ingram told ESPN's Ramona Shelburne after the game. "There's no timetable or anything like that yet, but they said he got it pretty good," Lakers coach Luke Walton said of Ingram, who came into the night averaging 15.7 points and 4.2 rebounds on the season. If Ingram misses time, Walton said he plans to staggerLeBron James' andLonzo Ball's minutes as much as possible so Los Angeles always has a steady ball handler on the court. The Lakers' backup point guard, Rajon Rondo, continues to miss time while recovering from a broken right hand, but he has ramped up his activity this week. With the Lakers already responding to injuries to Rondo and Ball in the early going, as well as suspensions to Rondo and Ingram, this is merely the latest obstacle to overcome. "Just next-man-up mentality. He's a big part of what we do," Lakers forwardKyle Kuzmasaid of Ingram. "Big part offensively and defensively, so for us, it's all about stepping up. Next man has to get in there." Brandon Ingram sinks the and-1 jumper, but rolls his ankle on the landing and would leave the game.